Lytham St.Annes Express, Thursday April 18th, 1935. Romantic Story of the " Eagle and Child." One of the oldest inns in the Fylde is the Eagle and Child at Weeton, where a centuries-old beam recently collapsed whilst re-thatching work was in progress. 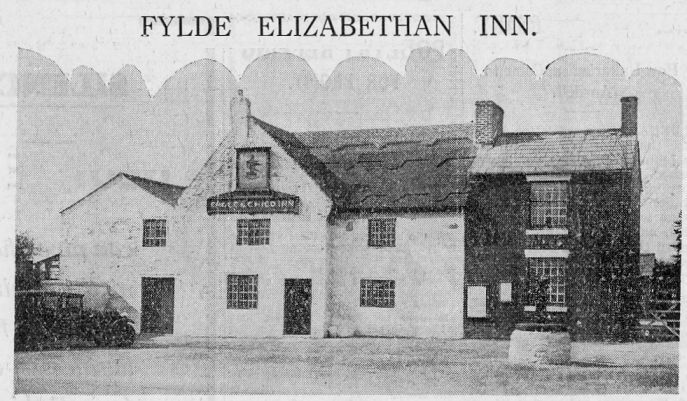 In this article our correspondent recalls some of the chequered history of this ancient inn. WITH thatched roof and inner walls composed of mud and straw, the Eagle and Child has weathered the storms of centuries. The beer-cellars and steps leading to them, still doing good service, actually date back to the year 1580. At this historic old place a feudalistic jury still meets once yearly, as it has done since the days of Queen Elizabeth. Although the officers appointed have little power in these days, good work is done in such respects as the inspection of brooks and waterways on the farm land of the district. It was from a room at this inn that the Press Gang Mr. J. Valentine. made its final haul from the Fylde district, taking two men, who were later killed in battle, in the year 1814. Mr. James Valentine, the present licensee of the Eagle and Child, is a keen student of local history, and during his 28 years at the inn has linked up its eventful story right back to Elizabethan times, and the history of its locality back to the times when the Danes occupied Weeton and built a road right through the district to Poulton, about the year 1040. Remains are still found occasionally when ploughing in the surrounding fields. In gathering information, Mr. Valentine has met and talked with descendants of each of the former proprietors of the inn for over 160 years back. In a dark corner of one of the public rooms of the inn is a small cupboard, dated 1699. This was at one time the hiding-place for the innkeeper's money. The method of making it secure was simple but effective. After locking the door, a piece of board was fastened over it, bringing the surface flush with the wall. This was plastered round with clay and then whitewashed. Several clairvoyants who have visited the house declare that at some time a person has been strangled near this cupboard. They have also given support to an old legend of the inn concerning a man long since departed this life, who is said to sit in the inglenook of this room, day and night, doing penance for his wrongs. His name was Moon, and he used to sit brooding in this corner before he committed suicide 300 years ago. When asked if any ghostly apparitions had been seen during his time at the tavern, Mr. Valentine told an amazing story. "I had locked up and retired to the living-room, when I heard sounds, as though someone were moving about in the middle room.
" I went to investigate, thinking that I must have locked somebody in.
" I shouted, but there was no answer.
" Then I heard footsteps from the direction of the bar, and, as I paused, a tall, soldierly man with white side-whiskers, stepped smartly past me and walked right through the locked door!
" I did not recognise the man as like anybody I knew, but was able to give a good description of him.
" I told several old local people of my experience, and each said that the man I described was undoubtedly Sergeant L ____. now deceased, who at one time was a frequent customer at the inn." During the reign of George III, a strolling minstrel from Lancaster used to visit Weeton at intervals, staying two or three months at a time. During these periods he was fed and sheltered by the villagers, in return for his services at the Eagle and Child, which in those days was open all night. He played a flageolet for dancing. which took place in the large upper room. This, no doubt accounts for the sag in the old oak beams, seen from the rooms below. This wandering musician was always bitter in his denunciation of the King and the Press Gang: so that it came as a shock to the people of Weeton when he dropped dead in Lancaster on June 16th,1815, and it was disclosed that he was the spy responsible for the Press Gang's well-timed visits to the district. There is in existence a letter addressed to a former proprietor of the tavern, in which he is reprimanded by the " night watch " for allowing fierce fighting between rival gangs of body-snatchers on the premises during the night. The old hostelry. like other property and land in the district, has been in the possession of Lord Derby's family for many generations. Except for a period of five years—when the holdings were captured by Cromwell, but granted back on the restoration of Charles II in the year 1660—the land in the Weeton district has belonged to the Stanlevs since about 1450. Mr. Valentine's tribute to Lord Derby' is: "He's the finest landlord in the country!"